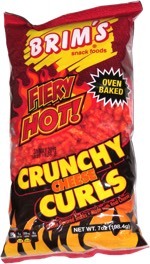 Taste test: This mix included barbecue-flavored triangular nacho tortilla chips, knot-shaped pretzels, barbecue-flavored Ringolos, barbecue-flavored corn chips, and barbecue-flavored crunchy cheese curls. The tortilla chips were clearly the standout of the mix, very crisp with a truly great flavor, one of the top tortilla chips of all time. Runner-up among this mix was the cheese curls, which were notable for being the only barbecue cheese curls I've tasted, plus they added a good texture to the mix. The barbecue corn chips were pretty good too, with a somewhat irregular shape (versus your standard Fritos) adding to their appeal. The Ringolos and pretzels came off a bit flat, both in taste and texture, as the potato-to-flavoring ratio in the Ringolos was too high, but the others were sufficiently flavorful that they sort of balanced each other out. The only major complaint was that there weren't more of the in-demand tortilla chips in the bag. From the package: “Go for more. 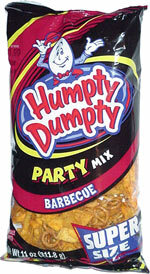 Go for Humpty Dumpty.” ... “Servings Per Container: 11” ... Ingredients include Calcium Hydroxide.